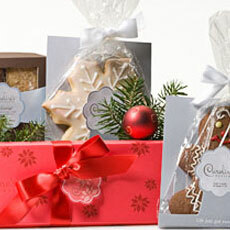 Warm winter hearts with this distinctive collection of our holiday treats! The Winter Suite features four of our seasonal favorites ready for gifting in a festive gift basket. Our Holiday Krispette Collection in a special holiday gift box; which includes our seasonal stars Peppermint Spark and Egg Nog cozied up with Mint Everest and Roca Crunch. Artisan shortbreads add a warm touch with Chocolate Dipped Chocolate Spice, Orange Pecan, Ginger and Chocolate Dipped Tradtional. Nestled alongside find two of our all time favorites; elegant in its simplicity a snowflake sugar cookie and spicy gingerbread boy in his winter best. All natural and organic ingredients.